What a place, you would think that by 2015 it would be buggered like most other popular places. But, it's one of the great survivors. 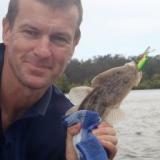 I can't say that in a week the fishing has been spectacular, because by Yamba standards the fishing has been pretty poor. The setting, the facilities, the weather, the beauty of the place have made up for the lack of fish. We have a place overlooking Convent beach. Million dollar view and the most basic place but adjacent to Yamba point which on its own is a great place to fish. Due to family commitments there have only been 3 fishing outings. 2 out in the boat with the boys chasing flathead. Neither trip raised a keeper, but, did at least run the new outboard in. A lovely new 15 HP Yamaha outboard. Both times the boys at least caught a flathead, undersize but a fish nonetheless. The other trip was on Tues 23rd. I went out to Yamba Point at 7am, I couldn't sleep, so thought I would have a go at the blackfish on the point. The tide wasn't right, it was still rising until 10am. I hooked a big fish early, which could have been either a big blackfish or a drummer and broke the trace above the swivel. I also hooked a fish which threw the hook on landing. I sat down and watched the sea for a while until the tide turned and then concentrated on the one little run. Tricky place to fish. If you didn't know better you would look at it and not fish it. It looks dangerous, but is actually completely safe, with a reef out around 50m that takes the power out of most waves. The worst you do is a little wash and a little spray. Once the tide was well and truly turned I hooked and landed two lovely fish, both going a tad over 40cm and solid round fish well over 1 kg. The quality at least made up for the lack of quantity, and fishing at your favourite spot is always a great way to reset for the oncoming year. All the best for a fishy 2015.